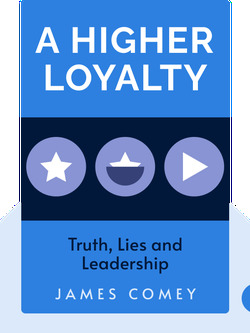 A Higher Loyalty (2018) is the revealing account of James Comey’s history as a respected public servant across multiple presidential administrations. Comey guides readers through many years of experience, including his fight against unlawful torture and surveillance policies during the second Bush administration, and his experience with the Trump presidency. Formative events in James Comey’s childhood include being bullied and having a great boss. James Comey was born in 1960, in Yonkers, New York, where his family had lived for generations. His grandfather was once the chief of the Yonkers Police Department; so you could say Comey has law enforcement in his genes. But when his family moved from Yonkers to nearby Allendale, New Jersey, Comey went from being a popular kid to being the target of cruel bullies. The move happened when Comey was in the fifth grade. He was the scrawny new kid at school with a bad haircut, ill-fitting clothes and a habit of talking too much. To save money, Comey’s mom would patch up old clothes and give her son haircuts – putting a bullseye on him for the school bullies. Despite being repeatedly punched, slammed into lockers and treated to wedgies, being bullied taught Comey some formative lessons. For starters, it made him very attentive at reading people. If you’ve ever been bullied, you probably know how to pick up on the signs of aggression that bullies give off. But perhaps more importantly, being bullied instilled a lifelong desire to help the defenseless. Also helping to shape Comey was a man by the name of Harry Howell; owner of the local grocery store that Comey worked at when he was in school. Howell taught Comey some important lessons about being an effective leader. He showed Comey that you could be powerful yet compassionate and understanding at the same time. Howell was a tough boss with very high standards, and he took pride in having an immaculately clean and organized store. While Howell was often demanding, he also knew when to show mercy. One day, while the store was closed, Comey had overstacked the milk crates, causing them to tip over, creating a river of milk down one of the aisles. Comey was mortified, mopping it up as fast he could. But when Howell appeared, he didn’t angrily berate Comey. He simply asked, “Did you learn a lesson here?” Comey certainly had. “Good. Clean it up,” Howell replied. This mercy motivated him to work harder than any punishment would have. After some life-changing events, Comey learned the importance of humility as a New York lawyer. In prosecuting mobsters and moving to Virginia, Comey learned more lessons in leadership and life. Prosecuting Martha Stewart was necessary under a fair and ethical system of justice. As an attorney at the Department of Justice, Comey fought for lawful practices in government surveillance. Comey fought the White House on their torture policies as well. As director of the FBI, Comey sought to be a great leader of a more ethical, effective and diverse organization. In the wake of a violent 2015, Comey was moved by President Obama’s understanding and effective leadership. During the 2016 election, Comey had to make a difficult choice in the Clinton investigation. In working with President Trump, Comey saw many similarities to a mafia boss. Comey didn’t expect to be fired, but he’s hopeful that justice will prevail. Start your free Blinkist trial to get unlimited access to key ideas from A Higher Loyalty and over 3,000 other nonfiction titles. With bitesize text and audio, it's easier than ever to find the right ideas to transform your life.